It's Tuesday and I decided it would be a great time to list my Top Ten Baby items for ages 0-5 months. I would love to start by introducing the newest member to the family, my pretty little princess. It is so nice to have a baby in the house again, we are all loving every minute of it. Of course with babies, comes a lot of stuff, but I've found quality is a whole lot better than quantity. Here's my list of top baby items for 0-5 months. Perfect for the baby to look at and discover on their own. 3 and 4. Babies love to look at themselves in the mirror, even if they don't realize it is them that they are looking at. You can also put up pictures of babies on the wall, so she can look at other baby faces. 7. My sister sent us a Crochet octopus that is super cute and it's one of our favorite toys. It's important for baby to have different textures to feel and play with. ﻿8. A must for me was my sling, I know it's not really the Montessori way, but I love baby wearing. 10. Books, Books, and more Books. It's never to early to read to baby. We love book time. If you can't afford to start a collection of books now then visit your local library, they have so much to choose from. 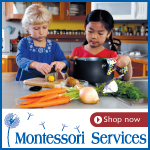 You might be interested in reading Montessori Child Development Stages here. So there you have it my Top Ten Baby items for little Miss Bell. 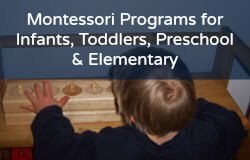 I hope you enjoy reading this and can use some of these things for your Montessori baby. I would love for you to join me on Facebook and Pinterest. Lastly, here are a few items that we love having for baby. If you purchase any of these items from Amazon through my blog my family will receive a small commission. A great big thank you goes out from my family.